Social commerce plugin can be used for online buying and selling the products added in the site. Many ecommerce applications can be created using the social commerce plugin. Here the users are able to purchase and sell the product added in the site. These services are done online. The main control on this plugin is for the administrator. The administrator has the only power to set the settings for the plugin regarding the purchase and the adding of products in the site. We can have the recommendations available for the products and services in the site. Several checkout methods are used in this plugin. This plugin helps to integrate with the payment options like PayPal to check out the product from the cart. Each user can create own store. Physical and digital products can be added. Administrators can add new category. Coupon codes are also added by the administrators. Out of stock email are sent. The Social Commerce plugin is a feature rice plugin that allows the buyers to convert the Elgg application into a social store. It allows people to create a hosted shopping cart in Elgg. Buyers add items to their cart and will go through a set of process to checkout method and the payment will be done according the checkout method chosen by the user. This all takes place on a small corner of a merchant's personal or business profile page on a social networking site. Administrator defines the payment options, shipping options, withdraw options etc. Administrator also defines the commissions. The plugin is designed in a modular structure; hence Elgg developers can add new shipping and payment modules easily. The Social Commerce plugin has released with the widgets, like "My Products", "My Purchases", "Top Rated Products", "Best Sellers" etc that can be placed in the profile pages. 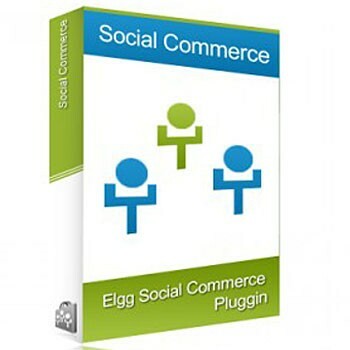 The Social Commerce plugin is a great step to make your Elgg applications as a online Market. This shopping cart solution provides a solution for merchants to manage inventory centrally while still tapping into social commerce.